If you are a fan of the Toho movie Godzilla vs Megaguirus then this 58 page book published by Kodansha in 2000 is perfect! There are great FULL COLOR action scenes of Godzilla battling Megaguirus, the transformation of Meganulus into Megaguirus, and the Cast. Features information on super weapons and some of the best photos we’ve seen from the movie. No behind the scenes photos, but the photos from the move are ACTION PACKED!! The book dimensions are approximately 8 1/2 by 10 inches. What an incredible vintage book! This book published in 1983 is in FANTASTIC condition. The world of Toho SPFX movies is brought to life in this vintage 1983 soft cover book There are 50 pages of high quality glossy photos of the major Science Fiction movies made by Toho from 1954-1980. The movies included are: All Godzilla movies from 54-75, Rodan, Mothra, Frankenstein Conquers the World, Yog, King Kong Escapes, War of the Gargantuas, Matango, Latitude Zero, The Human Vapor, Battle in Outer Space, Atragon, The Mysterians, Gorath, The Last War, Japan Submersion and War in Space. 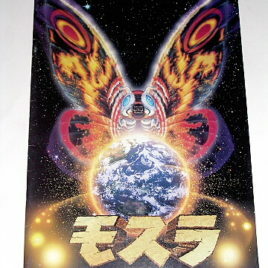 This is a must have for all fans of Japanese Science Fiction Movies. The book measures 8 by 12 inches. This is a great Hobby Japan Magazine. It contains 118 pages of wonderful photos of many Giant Monster Models of Godzilla 2000, Baragon, Angilas, Mechagodzilla, and Ultraman. It has an instructional section on taking a Godzilla 2000 vinyl figure and customizing it. There are step by step photos of this and also step by step instructions on How to Build a Kaiju (monster) Garage Kit. There are a few behind the scenes photos of the making of Godzilla 2000 especially showing the suit and an interview (in Japanese) of Tsutomo Kitagawa the current Godzilla actor. This is a must have for Fans! This book includes a BONUS 11 X 20 INCH FOLD OUT POSTER OF GODZILLA 2000 ON A RAMPAGE!! The book measures 11 1/2 by 8 1/4 inches.